Blondie and Brownie: Key Lime Pie and Swingles! Tangy and sweet with a wonderful graham cracker crust their pie is perfect for a picnic or barbecue. 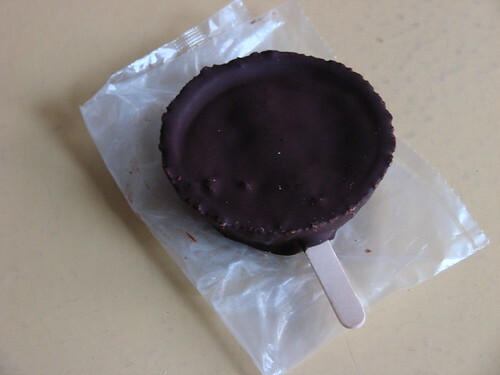 Better still is their Swingle, a frozen mini key lime pie on a stick dipped in dark chocolate. Quite possibly one of the most awesome thins I've eaten on a stick. If you're looking for a treat for your 4th of July celebration, Steve's is open today (July 3rd) and according to their twitter, they "still have Swingle-minis for our Twitter friends, mention the Tweet and you'll get the sweet with purchase of 8 or 10" Pie. OPEN TODAY!" Sweeet. Hours can vary, so the best bet is to check their Twitter. I've had good dates around the East Village, Avenue A or B. Specifically, I've gone to Flea Market Cafe and Back Forty and had a good date. Another fave of mine is Little Owl. @hungrygirl: It's been a long time since my last first date, but Lawman and I do love a good cheap date. I really like Kashkaval as a date spot. It's a gourmet market in the front and a cozy wine bar in the bar. The food is delicious, lots of plates for sharing--the tapas sampler plate is great and they also do both chocolate and cheese fondue. http://www.kashkavalfoods.com/ Have a great time! Growing up in Miami with a key lime tree in my backyard, I've been pretty skeptical of Steve's, is it really that good? I don't live too far away but the idea of good key lime pie in Brooklyn seems preposterous.